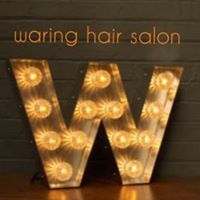 The Waring experience – relaxed, friendly, welcoming and professional – begins as you enter our stylish modern salon. Using the very latest products from GHD, Wella, TIGI and Sebastian you will be delighted with our expertise in colour, cut and styling. Enjoy a complimentary drink from an extensive range that will suit all tastes: juices, squashes, still and sparkling waters, teas and coffees, hot chocolate and wine or lager. Sit back and discuss your styling requirements and then luxuriate in the waring experience.